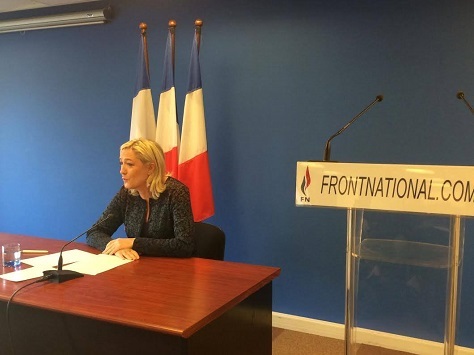 Under his daughter’s leadership, the Front national (National Front) has moved, at least cosmetically, somewhat closer to the center. Le Pen fille is a much more polished leader far better suited to contemporary political campaigns than her father, and she’s distanced herself and the party from its anti-Semitic roots. That, by the way, is only one of the reasons that Marine is feuding with her father, who believes his daughter is far too moderate and wishy-washy. The center-right has moved closer to Le Pen in recent years. Nicolas Sarkozy, who recently won the leadership of his party, the Union pour un mouvement populaire (UMP, Union for a Popular Movement), in a comeback bid to return to the presidency in 2017, had no problem running (and governing) hard to the right on issues like immigration. The UMP, unlike many Western European center-right parties, strongly opposed president François Hollande’s push to enact marriage equality. That Marine Le Pen is more popular than her father is not to say, however, that she commands a serious chance at amassing a majoritarian coalition that, among other things, views France’s five million Muslims as suspect second-class citizens, fears immigration and would pull France out of the eurozone — and, as of today, apparently, wants to hold a referendum on reintroducing the death penalty. It’s true that, if the presidential election were held today, Le Pen stands a reasonable chance of winning one of the two spots to the runoff. An IFOP poll from October 28-30 shows that Le Pen wins around 30% support, far more than the 17.9% she won in her third-place showing in the 2012 election, and enough to land in first place against either Hollande or Sarkozy, as well as Alain Juppé, the former foreign secretary and Manuel Valls, the current prime minister. But Le Pen would lose a second-round race in a landslide against Sarkozy, Juppé or Valls. It’s closer in a runoff against Hollande, whose popularity rating hovers between 15% and 20%, but consider that for a moment — even the most unpopular and despised president of the Fifth Republic would put up decent odds in a one-on-one race against Le Pen. If this were like Mexico or South Korea or Taiwan or the Philippines, a Le Pen victory might be a real concern, because those countries feature one-round presidential elections where the winner of the most votes is automatically elected, whether it’s with 20% of the vote or more than 50%. You might not be as optimistic that France will respond with the kind of magnanimous response that emphasizes its liberal values. You might even believe that, in the days, weeks and months ahead, France will darkly turn toward anti-Muslim sentiment, and it’s true that the initial reports of widespread peaceful rallies in support of freedom of speech have been interspersed with jagged reports of attacks on French mosques. We’ll certainly see more anti-Muslim rhetoric in the future, especially from politicians like Le Pen, and maybe she’ll even gain some supporters from the tragic fallout of the Charlie Hebdo massacre. It’s still a long way to winning a majority of the French electorate. So while the threat of a Le Pen resurgence is real, predictions of her impending presidential inauguration exaggerate the extent of her threat — and willfully ignore France’s electoral system, which is designed precisely to minimize extremists of all varieties from entering the Elysée.